Saltwater fishes, otherwise known as marine fishes, are species typically found in habitats such as oceans and shores. In general, saltwater environments make up 98 percent of all the water on Earth. Thus, these bodies of water yield a wide variety of types of saltwater fishes for anglers to catch, such as amberjack, bass and tuna. Saltwater fish species are popular sources of animal protein in various parts of the world. For that reason, various types of saltwater fish to eat are caught by recreational anglers. Generally, saltwater fishing is an accessible activity for individuals of different ages and skill levels. To learn more about saltwater habitats, fishing gear and regulations, read the sections below. Where can I catch saltwater fish? Oceans – Open oceans are optimal habitats for species such as amberjack, grouper, mahi-mahi and Additionally, certain types of grouper and red snapper tend to prefer ocean depths, which makes them bottom-dwelling species. Seas – Seas are shallower parts of oceans. Thus, they are suitable for saltwater fish species such as amberjack and tuna. Additionally, marine fish species such as sharks, turtles and squids may be found in a sea. Shores – Several types of saltwater fishes can be caught from shores, such as amberjack, bass, catfish, grouper, mahi-mahi and red snapper. For that reason, shores are among the most popular fishing spots for anglers. Additionally, these habitats do not typically require the use of a boat. Estuaries – An estuary is a habitat that contains both saltwater and freshwater properties. Moreover, a mahi-mahi is an example of a saltwater fish that can be caught in such an environment. Coral Reefs – Bottom-dwelling saltwater fishes are known for regularly seeking shelter in underwater structures. Thus, these species are also known for inhabiting coral reefs. What gear do you need to catch saltwater fishes? Rods – Casting rods and spinning rods are some of the most efficient saltwater fishing rods an angler can possess. Additionally, various types of fishing nets can be utilized to catch large schools of fish. Reels – Anglers must use the correct combination of rods and reels in order to catch saltwater fishes For instance, bait casting reels are suitable for casting rods, whereas spin-casting reels are most effective when paired with spinning rods. Lures or baits – Artificial lures such as jigs and soft plastics can be used effectively when saltwater fishing. However, live baits are generally more effective. Thus, saltwater species have a higher chance of being entice by crustaceans, baitfish or other small fish. Hooks – Different types of saltwater fish require varying types of fishing hooks. For instance, an extra wide gap hook is best suited for catching a largemouth bass. Conversely, a circle hook is enough to hook a small grouper. Lines – Braided lines, monofilament lines and fluorocarbon lines are the most common fishing lines available on the market. A braided line is the best choice when fishing for heavy saltwater fish species. On the other hand, a fluorocarbon line is more suitable when catching fish that are easily scared off. Note: Commercial anglers and fisheries employ different fishing techniques in order to catch large schools of fish. 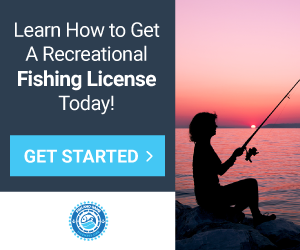 Are there regulations for catching saltwater fish? The United States Fish and Wildlife Service (USFWS). The Atlantic States Marine Fisheries Commission (ASMFC). The Pacific States Marine Fisheries Commission (PSMFC). Anglers who intend to catch marine fishes must also obtain fishing licenses that reflect their fishing purpose and residency status. For instance, a license is typically limited to either recreational or commercial fishing. What are the different types of saltwater fishes? Various types of saltwater fishes are found in oceans, seas and estuaries. However, most saltwater species are not suitable to become aquarium fishes. Furthermore, many kinds of saltwater fish require different rods, lures and baits to catch them. Explore some of the most popular saltwater fish species in the sections below. Various types of bass fish are available for harvesting in the United States. For instance, bass fishing can yield species such as the largemouth and smallmouth bass, as well as the black sea bass. Furthermore, popular bass fish spots include saltwater environments such as oceans or freshwater habitats such as lakes, ponds and streams. In general, bass fish bait such as crustaceans and insects work better than bass fish lures of the artificial kind. Catfish fishing can yield channel, blue, white, brown, yellow, black, stonecat, flathead, gafftopsail and hardhead catfish. Moreover, different types of catfish fish can be found in both saltwater and freshwater environments. In general, catfish fish bait can include live or dead materials, such as plants, aquatic insects or small mammals. While a catfish fishing season can vary across different regions, the best time to catch these fish is typically at night. The Gulf of Mexico, as well as the Indian, Pacific and Atlantic oceans, are optimal tuna fishing locations. In general, most types of tuna live in tropical, subtropical and temperate oceans. However, they are migratory fish that travel through great lengths in order to feed and reproduce. Furthermore, popular types of tuna fish include the skipjack, bigeye, albacore, Bluefin and yellowfin tuna. In most places, tuna fishing season takes place year-round. However, in states such as Massachusetts, Bluefin tuna can only be caught between the summer and fall months. Popular types of grouper fish include the black, gag, goliath, Nassau, red, scamp, Warsaw, yellowfin and yellowmouth grouper. Moreover, grouper fishing typically takes place in the Atlantic Ocean and the Gulf of Mexico. However, a grouper fishing season can vary according to each species. For instance, gag grouper fishes are only available in the South Atlantic from May through December of each year. RELATED GUIDES - ALL RECIPES! Red snapper fishing typically takes place in regions nearby rocks, reefs and other underwater structures that provide shelter. Additionally, a red snapper is known for inhabiting depths between 30 and 620 feet underwater. Moreover, a red snapper is generally native to the South Atlantic Ocean and the Gulf of Mexico. In general, red snappers prefer to eat other fish, worms, shrimp, crabs and squid. However, red snapper fishing lures of the artificial kind may also be efficient. The Gulf of Mexico and the Atlantic Ocean are optimal locations for amberjack fishing in the United States. In general, amberjack weigh from 25 to 60 pounds. On the other hand, certain species can weigh 150 pounds or more. For that reason, large types of amberjack are often considered trophy fish. Moreover, an amberjack is more prone to striking at a bait that floats on a surface. However, amberjack fishing lures can be also be effective when drowned at great depths. Mahi mahi fishing is a popular sport in the Atlantic and Pacific oceans, as well as in the Gulf of Mexico. Moreover, this species is particularly common in states such as Hawaii. In general, a mahi mahi is brightly colored and has a unique appearance, making it a fun and interesting catch. Common mahi mahi fishing lures include spoons and jigs, but certain types of live bait can also be used effectively. Additionally, this species is highly sought-after as seafood and has yielded various delicious fish recipes. The west coast of the United States and Alaska are optimal salmon fishing locations. Salmon inhabit both saltwater and freshwater habitats, which is a trait that makes them distinctive. Thus, recreational anglers can catch this species in oceans, rivers or streams. Moreover, salmon fishing lures will vary according to different bodies of water. Once caught, this type of fish provides excellent nutritional value and tastes great in a variety of dishes.